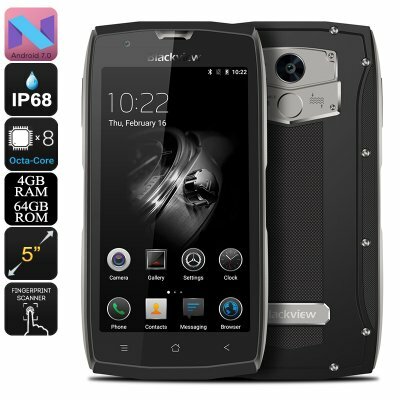 Successfully Added HK Warehouse Blackview BV7000 Pro Android Phone - IP68, Octa-Core CPU, Android 7.0, 4GB RAM, Dual-IMEI, 4G (Grey) to your Shopping Cart. The Blackview 7000 Pro is a stylish looking Android phone that features a tough and durable IP68 design. Allowing you to use it in the most extreme of environments, this mobile phone is resistant to water, dust, drops, and more. Running on an Android 7.0 operating system, it is guaranteed to deliver a smooth user experience that comes packed with the latest software features available to the market. Whether you’re into games, movies, or simply like to use it for browsing the web and staying in touch with friends and family – this Chinese smartphone is guaranteed to meet all your demands. The Blackview 7000 Pro comes with a 12 months warranty, brought to you by the leader in electronic devices as well as wholesale electronic gadgets..
Arabic: - 5 بوصة الروبوت الهاتف - Chinese Simplified: - 5 英寸的 Android 手机 - Czech: - 5 palců Android telefon - Danish: - 5 tommer Android telefon - Dutch: - 5 inch Android telefoon - French: - 5 pouces téléphone Android - German: - 5-Zoll-Android-Handy - Hebrew: - טלפון אנדרואיד 5 אינץ ' - Hindi: - 5 इंच एंड्रॉयड फोन - Italian: - Telefono Android da 5 pollici - Japanese: - 5 インチの Android 携帯電話 - Korean: - 5 인치 안 드 로이드 전화 - Malay: - Telefon Android 5 inci - Norwegian Bokmål: - 5 tommers Android telefon - Romanian: - Telefon Android 5 inch - Russian: - 5-дюймовый Android телефон - Spanish: - Teléfono Android de 5 pulgadas - Thai: - โทรศัพท์มือถือขนาด 5 นิ้ว - Turkish: - 5 inç Android telefon - Vietnamese: - Điện thoại Android 5 inch.